Zionist Union party leader says he will never join government led by Netanyahu. 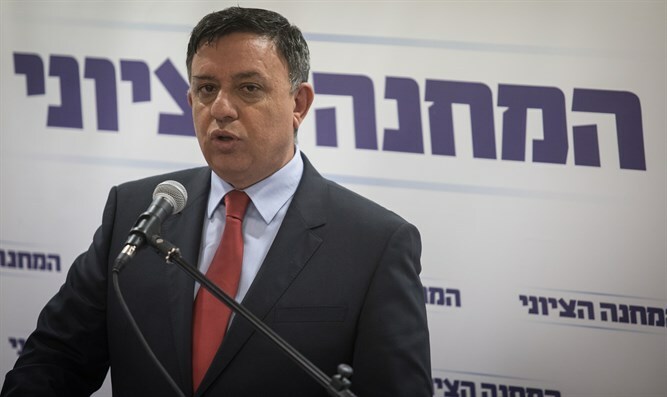 Zionist Union Chairman Avi Gabbay said Friday that he would not join Prime Minister Netanyahu's government. "After a decade as prime minister, Netanyahu did not succeed in bringing security to the south, he did not solve the problem of the cost of living, and housing prices in his time only rise, so if Netanyahu is elected again I will not join a government he heads," Gabbay said in an interview with Radio 103 FM. He sharply criticized Netanyahu's handling of the conflict with Hamas. "He led us to surrender, and he took this step at a point where we are weak, not Hamas. Four years after Protective Edge he took this step. Hamas was on its knees. The defense establishment put its recommendations on the cabinet table, but the Cabinet is afraid to accept these recommendations. The cabinet members mix political considerations with security considerations. Each of them afraid not to be the most right-wing in the room." "Avigdor Lieberman has been in his position as defense minister for two years, and from this year the citizens of the south are under fire, and these facts can not be changed. For a whole year, they have led us to negotiations. We pay protection fees to Hamas. I support the agreement and not the operation, but we reached this situation in the wrong way," he said. Gabbay was asked whether he had the skills to be prime minister. "When Binyamin Netanyahu was appointed prime minister in 1996, he was 47 years old, four years younger than I am. He took office after he was deputy foreign minister and ambassador to the United Nations. I arrive at the age of 51 with a lot of experience: I led people, I succeeded in my life, I managed to go from nothing to where I came from [before entering politics]. I was CEO of large companies, I was a minister. And the young generation in the country, we need normalcy, we need a single prime minister, and I'm the address." He also addressed the upcoming primaries in his party. "I will do what others do in a hypocritical way. To this day, people have been running activists and saying what they want through other people, and running the primaries indirectly and dishonestly in front of the public. But I am not a hypocritical politician, and in my opinion one of the things a party needs to win the elections. It is a good team that knows how to work together, so I will publish a list of recommended candidates, and on the other hand, no party member should vote for my list, and I believe there will be those who say 'I will not vote for him.'" "I would be very happy if Benny Gantz joins the party, it will strengthen us and also calls upon Ehud Barak to join the Zionist camp and act from it," concluded Gabbay."